Another jewel of the beehive! 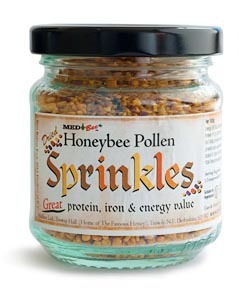 Bee amazed at MediBee Bee Pollen Sprinkles – every sprinkle denotes one hours work by an individual bee. Bee astonished at their different colours – each colour defines a different floral source – brassicas, herbs, field flora, meadowsweet, tree blossoms and orchard flowers – to name but a few! Sprinkle 1-2 teaspoonfuls daily in yogurt, over cereal and ice cream, besides their explosive taste over salads and between sandwiches. Do not cook Sprinkles – you will destroy their precious nutritive value.